The interest in the influence of videogame experience in our daily life is constantly growing. “First Person Shooter” (FPS) games require players to develop a flexible mindset to rapidly react and monitor fast moving visual and auditory stimuli, and to inhibit erroneous actions. This study investigated whether and to which degree experience with such videogames generalizes to other cognitive control tasks. 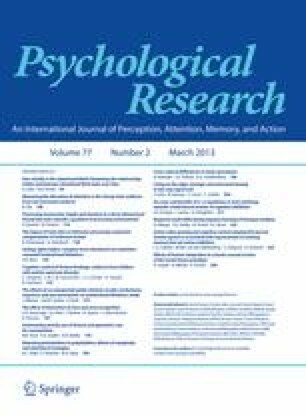 Experienced video game players (VGPs) and individuals with little to no videogame experience (NVGPs) performed on a N-back task and a stop-signal paradigm that provide a relatively well-established diagnostic measure of the monitoring and updating of working memory (WM) and response inhibition (an index of behavioral impulsivity), respectively. VGPs were faster and more accurate in the monitoring and updating of WM than NVGPs, which were faster in reacting to go signals, but showed comparable stopping performance. Our findings support the idea that playing FPS games is associated with enhanced flexible updating of task-relevant information without affecting impulsivity. We thank Pim Bakker, Iris Doorgeest, Miralda Fesselet, Yara Tiggelhoven, Paulien Brower, Leonie van Wijk and Liesbeth Crezee for their enthusiasm and invaluable assistance in recruiting the participants of this study. The research of LSC, WvdW, and BH is supported by NWO (Netherlands Organization for Scientific Research). Colzato, L. S., van den Wildenberg W.P.M., & Hommel, B. (2007). Impaired inhibitory control in recreational users of cocaine. PLoS ONE, 2, e1143. http://www.plosone.org/doi/pone.0001143 .